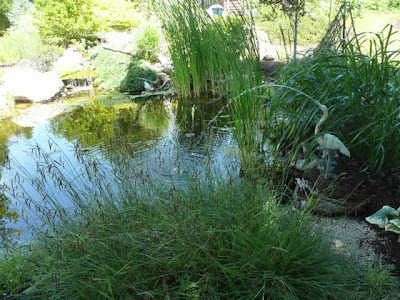 Here are the photos of the garden walks I said we attended while on vacation. 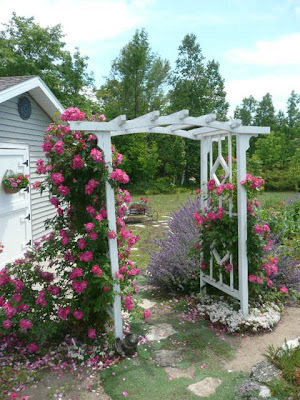 This rose arbor with creeping thyme meandering between the flagstone path was amazing. 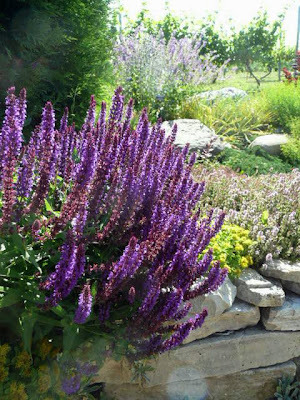 The homeowner told us that the thyme she used is called "Nutmeg" and it flowers later in the summer in beautiful shades of magenta. These are the Lilliputian gardens. They were adorable! This one was called "Secret Garden"
This one is my favorite - the little birdbath has a tiny frog in the center! 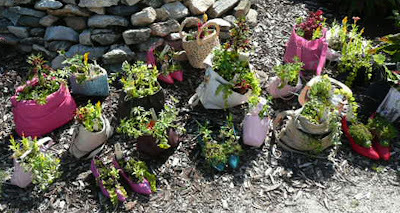 These perennials were planted in donated shoes and purses and were being sold as a charity fund raiser. 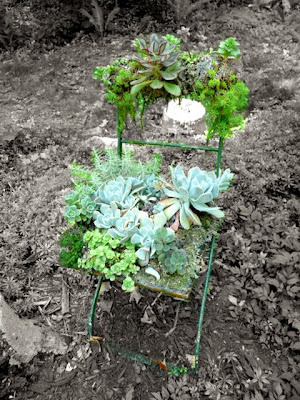 I adore this bistro chair planted with a variety of succulents. Chicken wire and sheet moss were used as the base for the plants. 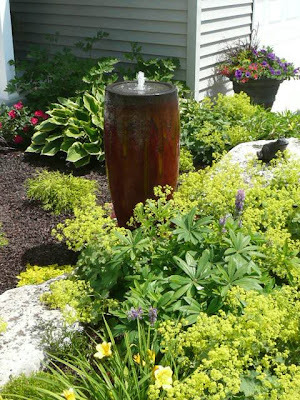 One garden featured a bronze plant kaleidoscope created by a local artist. Unfortunately I was so amazed at what I saw through the lens that I forgot to take a picture of the kaleidoscope itself! 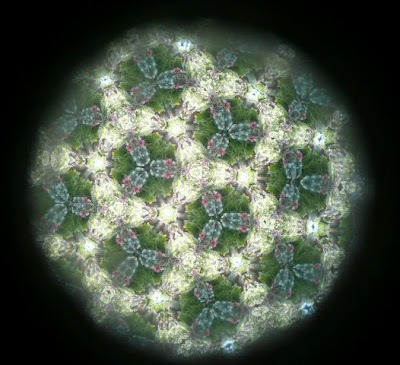 The kaleidoscope was aimed at a bronze planter which you could rotate to create some awesome designs. This free-form fence in the grass garden was a wonderful example of form and function. 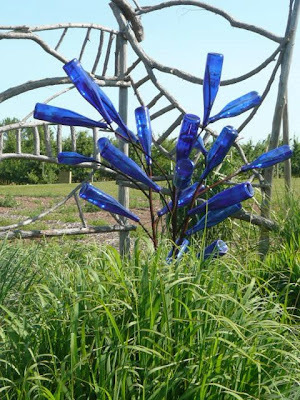 And what garden wouldn't be complete without a re-bar blue bottle tree. I want one! 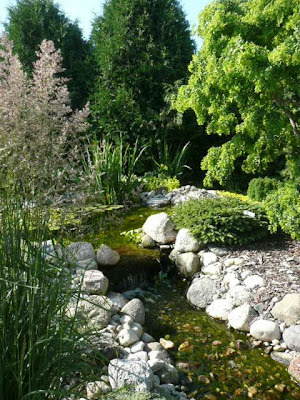 Water features always add a serene touch to a garden. Love the lily pads in this pond. We discovered little surprises throughout the gardens, like this tree fern shown below. 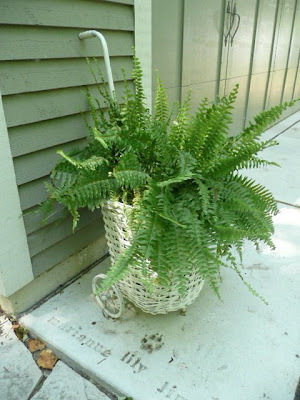 The simple use of an antique wicker cart as a planter for this Boston fern add a nice vintage touch. Notice the names and hand prints of the family's children as well as the paw print of their dog, Lily stamped into the concrete stoop. 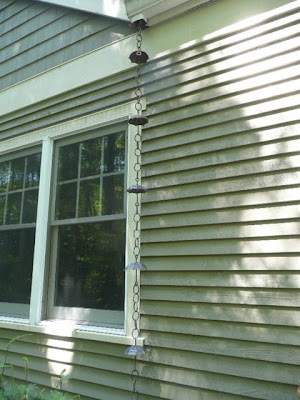 Around the corner I discovered this "rain chain" attached to the gutter. The rain gently flows down over the tiny bronze umbrellas. 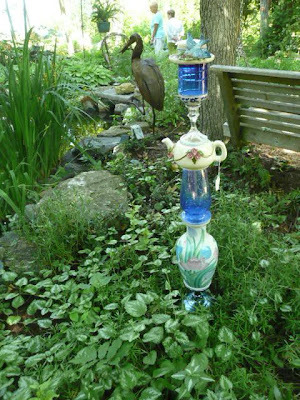 A local artist created this whimsical piece of garden art using thrift store glass and china pieces. 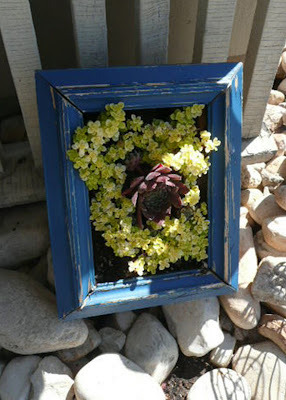 Another neat idea that was new to me were these shadowbox frames planted with succulents. Several of the gardens had them. 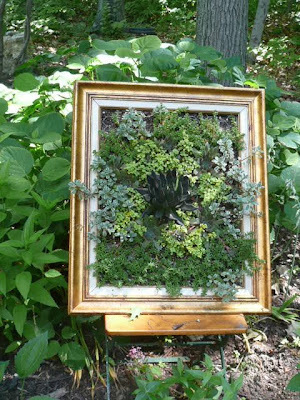 They simply took an old frame and attached it to shallow pine box filled with soil, moss and chicken wire to hold the plants in. This one is propped on a rusty metal easel. The small blue shadow box planter leans against a fence. And the shadowbox below sits on a bistro garden chair. 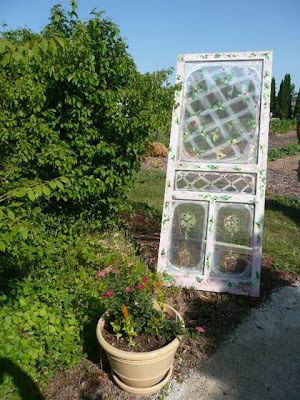 And why not paint a a pretty design on a vintage screen door for garden art? 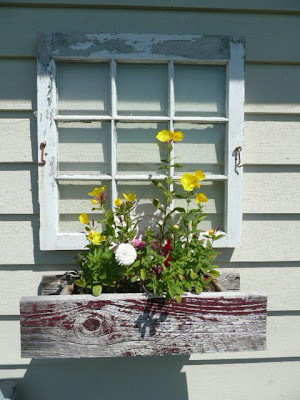 Or attach an old window frame above a window box to dress up the dreary wall of a garage. 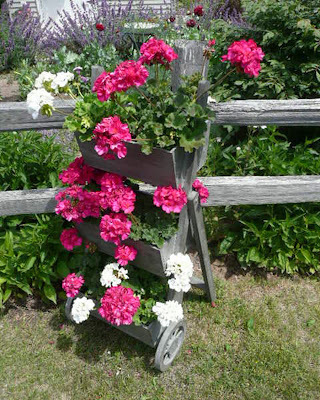 Did you ever think of putting a pot of geraniums in an old metal colander? 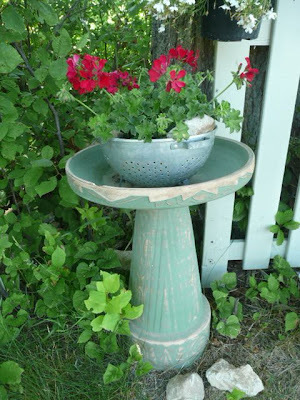 And why not put the planted colander on top of a birdbath? 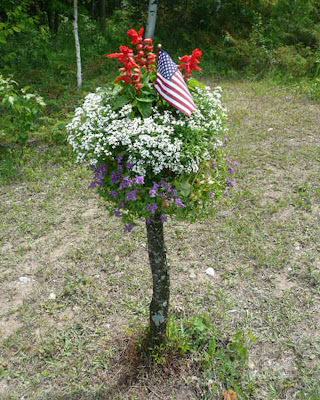 I thought this was a clever way to put an old tree stump to good use. 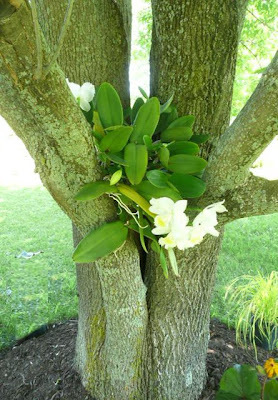 We always cut ours down to ground level or remove them completely, but this gardener left part of the trunk in tact, screwed a planter on top of it and filled it with hanging plants. Here's another trunk that she topped with a birdhouse. It's such a simple idea, but one I never thought of myself. This weathered tiered cart is darling. 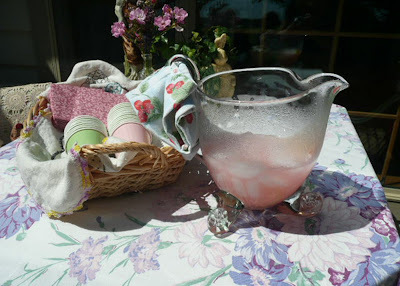 This homeowner on the garden walk treated us to homemade mini cupcakes and pink lemonade on her deck. What a wonderful place to relax! Don't you just love this footed glass pitcher? I NEED one! 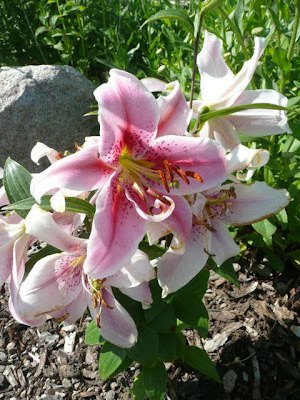 Thanks to all the gardeners (The Porter's, The Lhast's, The Goss's, The Waldron's, and the Master Gardeners at the UW Extension Office) who shared their scenic landscapes and gardening ideas with us. Next time I'll share the beautiful Clematis arbor and gazebo. WOW!!! that was some garden tour...SO many amazing and brilliant ideas...thanks so much for sharing...i want to try some of these for myself!!! 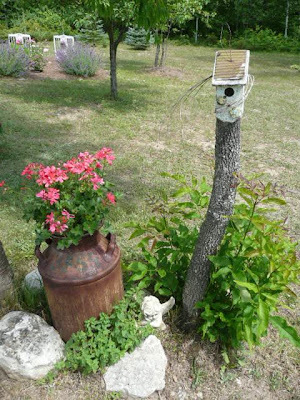 What a lovely collection of whimsical and fun garden ideas. Oh boy oh boy!!! I LOVED getting caught up on your blog. All your gorgeous pictures... all the amazing art and fun and inspiration! Thank you so much for sharing! great garden pictures! great ideas! I loved the little miniature gardens! Beautiful gardens! And so fun too! I love the variety of creative decorative pieces! Thank you for taking us along on the tours! Such lovely pictures of the gardens. I had not thought of using a picture frame. 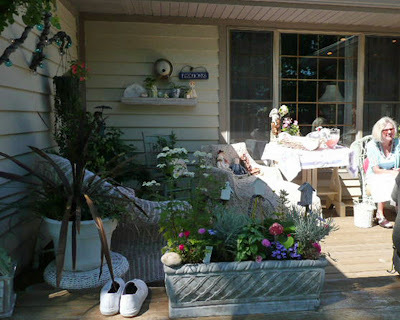 Love your garden ideas...great creative use of unconventional items...beautifully done.